This exciting multi-sport Veterinary CE Course takes place in the spectacular northern region of Patagonia. This area has some of the most fantastic mountain scenery in the world, including giant peaks with awe-inspiring glaciers, beautiful pristine forests, and resplendent whitewater rivers. The Futaleufu is considered to be one of the most beautiful and exciting whitewater raft experiences in the world! 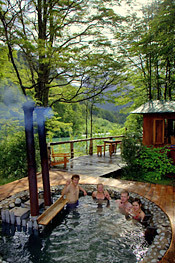 We will stay several nights at the fabulous Bio Bio camp right on the banks of the almost surreal turquoise Futaleufu. Each day of this CE course will be a new adventure! Several days will be filled spectacular, professionally guided whitewater rafting on the Rio Azul, the Rio Espolon, and the Futaleufu. You will also have the option to participate in horseback riding and hiking in the Andes and also be able to do optional mountain biking and fly-fishing for feisty brown and rainbow trout. The seminars typically take place each afternoon before dinner. Each night well enjoy gourmet meals and great camaraderie and stories from the day! Lectures: Dr. Alison Clode will present 18 CE hrs on practical management of common ocular problems. Awaken on the banks of the Fu and enjoy your first morning in camp! We rise with the warmth of the sun and have breakfast around 9 am. A pre-breakfast yoga class is available on our customized yoga platform with river views! Mornings tend to be crisp and dewy so prepare to dress warmly – a fleece is perfect. Today is a river day. We will launch our rafts from base camp after a thorough safety briefing. In a safe ‘eddy’, a short distance downstream, we’ll do a set of practice rescue drills. This allows the crew in each raft to hone their skills and prepare to raft as a team. Today we become experts at navigating our very own river crafts, known inflatable kayaks or IK’s. We venture up canyon to the source of the Rio Espolon as it cascades out of the Lago Espolón to find gin clear water and gentle class 2 and 3 rapids that offer a perfect learning opportunity to become a great captain of your own boat. If there is interest, before we paddle we will have a chance to stroll around the quaint little town of Futaleufú There is something deeply satisfying paddling your own boat down river, knowing that your destiny is in your own hands. Of course our highly trained guides will be there to coach you, watch over you and provide safety should you need to be rescued. The Rio Espolon is one of the major tributaries to the Futaleufu river and flows into the Fu right above the Inferno canyon which is where we take-out in the early afternoon. For those ready to try out a hard shell kayak, this is the perfect class 2-3 river to do it on! Surf and Turf up and down the Rio Azul valley! After breakfast we take a short drive to the stables where we will find our trusty steeds saddled up and ready for adventurous riding. After a safety briefing, we ride alongside some local expert equestrians and our own river guides who will gladly join the posse up a glorious, pristine side valley where the Rio Azul flows unhindered from its glacial headwaters. After a 3 hour ride, we stop for a picnic lunch and then trade in our saddles for paddles to test our talents on the challenging and fun Class 3 and 4 Rio Azul, a significant step up in difficulty from the Rio Espolon. This is a full biathlon day and you will be glad to return to camp, enjoy the soothing hot tub, a cold beer or glass of wine as you wait your turn to get a well deserved massage! After lunch, our first obstacle is “Throne Room,” a class V+ rapid for kayaks, a ghost boat rapid for rafts. By walking around this rapid, we get a great bird’s eye view of an almost ‘river wide’ hole that could destroy a raft. Back on board our rafts, we are dealt a Royal Flush; a continuous class IV corridor of rapids does not let up until we get to our take-out spot at the Rio Azul footbridge. The rafts are left for the night, tethered on shore. Early evening is spent in camp getting ready for the evening festivities. Blanca and her partner Umberto, locals from a nearby farm, prepare a very special treat for us. They merrily prepare a delicious dinner called “Curanto” that is typical of the south of Chile and the island of Chiloe. We spend the evening by the bonfire on the beach singing and dancing the night away. Today, we must be mentally and physically well prepared for the river. We call it the “summit day” as we aim to top our already great paddling days with the best day of white water in the world. After a nutritious breakfast, we head up river to the footbridge where we left the rafts yesterday. As our day on the river begins, the blue glacial run-off from the Rio Azul River merges into the Fu from the right. The views of the snow capped mountain peaks and jagged ridges of the mountain “Las Tres Monjas” (translated, “the three Nuns”) are absolutely breathtaking. A six-kilometer stretch of warm-up rapids leads us to the longest and toughest rapid that we will raft, “The Terminator.” We scout and study our line, then we take the plunge and drop in. “Left turn, right turn, dig it in — hard forward!” are a few of the commands that might be heard. The next three miles are non-stop rapids. After an aerobic workout, we pump through the enormous haystack wave train known as the “Himalayas”. Just when we need it, a calm returns, we float gently into lunch, served at our base camp. Very small intimate “class” size — our group had 15 or so – which enabled discussions as needed. The tour guides and owners were first class all the way. They looked out for our needs, made sure transfers went smoothly, and made sure that everyone was safe on the river. The food was fantastic local fare. The weather was hot and beautiful. I also did the extension (if you’re going to travel that far – you might as well go all the way!) – to Torres Del Paine which was breathtaking. The hiking in Torres was beautiful and at times challenging. The weather at Torres was variable and cool because it was a little late in the year, and much farther south than the Futa. I would recommend this trip to anyone considering it, and I would go on any other tour offered by this company – they were great! • Yoga Classes—on a beautiful river side deck with amazing views of river and mountains! • Ducky expeditions (paddle your own craft) down the rio Azul! • Horse riding on Criollo horses, gallop if you like, cross streams, amazing terrain! • Trail running or amazing hikes to remote alpine lakes or up to the snow line! • Hot tubbing and Finnish Sauna!